Hiring is a tricky affair and most often organizations have to face the brunt of hiring a wrong candidate. There is a lot at stake in terms of money and time in the recruiting process. But, there is one way that can help the organization in figuring out who the right candidate will be for the position. It is the age old personality test. It is not expensive at all, but it is highly efficient and is also completely fair to each and every applicant. Personality assessment test screens the job applicants without discrimination. It not only helps the hiring managers but also the applicants, in understanding that the job is not fitting for their personality. Hiring managers have found out a great tool to weed out the applicant and streamline the whole procedure of hiring. When an organization can take into account the behavior of an individual, his attitude and his belief, then they will be able to eliminate some uncertainties while evaluating whether the candidate is a good fit or not. In order to make good use of the personality test, it is important that the hiring managers interpret the result of the test correctly; else they will commit the same hiring mistake. What is a Personality Test for Job Interview? In today’s world, a personality test is completely web based tool and it has helped the hiring managers a lot. Now they won’t have to conduct a test on the venue itself. Moreover, it is time saving too, because now within minutes the candidates get to know how much they have scored and the hiring managers will have the explanation of the outcome of the test in their hands within no time. 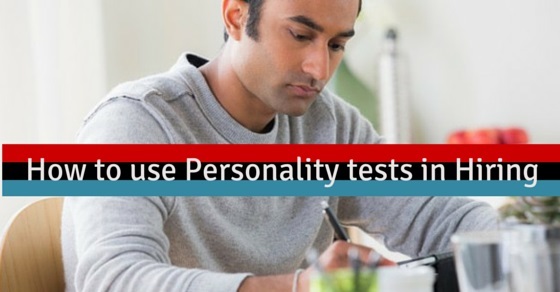 The personality tests mostly have multiple choice questions and at times the candidates might come across some true or false questions as well. Through these tests, the hiring managers come to know several things about the candidates that a simple job interview wouldn’t have been able to provide them. It should never be the key element in selecting a candidate, but yes, it can definitely serve as one of the factors in understanding whether the individual has the competencies and behavioral trait that is required for the job opening. The personality tests are used to measure a number of traits in an individual. It is mainly used in assessing the attitude, but in the field of management and sales, even the aptitude of the individual is tested through these kinds of personality test. If an individual is trying to acquire a job as an insurance broker, then his resilience and extroversion will be tested to see whether he has these qualities of a top sales person. In case of a security firm, an individual’s stress tolerance and mental strength will be put under scanner to ensure that he has the quality to handle this kind of a job. Honesty is a big thing in retailing because they have to handle cash and merchandise on a daily basis and this test will help the retailer gauge whether the individual has this trait in him or not! In order to maximize the benefit of this tool, it is important that the hiring managers know how to use the personality test. A wrong hire is detrimental for the small business. So, it is important that they decide correctly about whom to hire for the vacant position. Rather than going with their guts, it is very important that they try out the personality assessment test before hiring the candidates. It will impart them with fairness, perspective and balance that are imperative for making a right decision. It will also help them in the long run as well. The personality test can also help the hiring managers in deciding which individual will be fit for which job opening that they have. Not all jobs are suitable for everybody, so instead of using it to weed out people the test can be put to use in recognizing the talent that can be used for different jobs. It is not a good idea to have just about anybody assessing the test result. If they get it wrong, then the same catastrophe will occur in hiring. Therefore, it is important that you have some expert handling the result and interpreting it correctly. With the emergence of online personality tests, the business owners can now make use of it more easily. The cost involved in this kind of personality assessment test has also come down due to this reason. Depending on the requirement of the position, the tests can be customized, providing the hiring managers with the capability of hiring the right personality for the job position. It helps you by providing you with an insight into the person’s behavior and whether they have all the required traits for the job or not. In case, a person has applied for a managerial position, then it is very important that you know the person’s behavior. The test will reveal how confident the person is, his likeability along with his assertiveness. This will help the organization hire someone who is booming with fresh ideas and will infuse new energy into the organization. If you conduct the test prior to the final interview, then you will get to know how the person is. It will help you in preparing the right kind of behavioral questions for the candidate in the interview. If you are conducting the personality test, then ensure that you are conducting it for everybody. Else you might come under the scanner for discriminating, which you definitely do not want. The personality assessment test will help you in hiring a lot if you can assess the result well, otherwise it might be a disaster. Moreover, the testing must be treated as a guidepost and not as a preset label.